Whenever I speak at business conferences someone always mentions the challenge of generational differences in the workplace. Then the conversation always seems to segue to the challenge of Millennials. Many give Millennials a bad rap because they have different needs than Generation X and Baby Boomers but I believe we need to start thanking them instead. Why? Because Millennials will improve the way we lead and run our businesses. Millenials won't let you ignore them. You must engage them and engaging them will help you engage all your employees. This will lead to enhanced relationships and performance. Millennials want a relationship with their manager and leaders. Leaders will have to make time to connect and develop relationships with Millennials. This will make them better leaders for everyone in the organization. Millennials want to do work that matters. They want to make a difference. They won't settle for just a pay check. They don't want to work with a company that has no soul or purpose. They will force businesses to identify, live and share a greater purpose than just making money. This will make organizations more successful in the long run because people and organizations are most energized when they are using their strengths for a bigger purpose beyond themselves. Lastly, Millennials demand authenticity and transparency from their leaders and organization. This will have a huge ripple effect since authentic and transparent leaders help your organization build a stronger brand that connects with your customers. Leaders and businesses that understand this won't blame Millennials for being different. Rather they will learn how to lead Millennials and value their differences and in the process become better for it. Go a week without complaining about anything and see how it changes your life and team. Join us on April 28, 2018 in Columbia, South Carolina for the "Bus Stop" Conference! 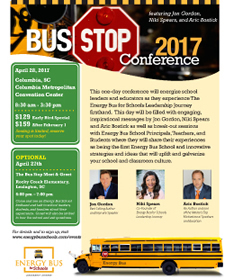 This one-day conference will energize school leaders and educators as they experience The Energy Bus for Schools Leadership Journey firsthand. This day will be filled with engaging, inspirational messages by Jon Gordon, Niki Spears and Aric Bostick as well as break-out sessions with Energy Bus School Principals, Teachers, and Students where they will share their experiences as being the first Energy Bus School and innovative strategies and ideas that will uplift and galvanize your school and classroom culture.